Why Functional Nutrition should be part of yours. 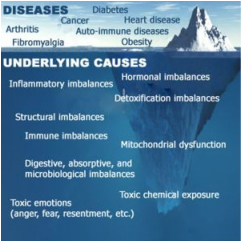 ​Functional Medicine approaches the body from the perspective of treating the root cause of disease. It looks at the foundational way that food affects your body on a cellular level. The food you eat in turn creates an environment that is balanced and thriving or can create disease/illnesses such as fatigue, brain fog, gastrointestinal distress and external symptoms like eczema and psoriasis. Traditional medicine is often centered around treating symptoms and while symptoms can offer insight into the body’s condition, my approach uses a combination of nutritional and lifestyle changes, along with natural agents (supplements, herbs, nutraceutical) to treat and heal the root-cause. Whether we will be working together to uncover the root cause of illness or to create a holistic plan for healthier living my approach will help you off the roller-coaster ride you have been on since your body began to change. ADD what’s lacking in the body preventing you from optimal function. This may include the addition of physical activity and dietary changes to optimize nutritional balance. REMOVE anything that impedes the body from moving toward this optimal state of well-being. Their maybe certain foods that are causing an inflammation response or a nutritional deficiency that is blocking the body's ability to heal. ​Our bodies are designed to be healthy. However there may be factors missing that are needed by the body to function at its best or something might be standing in the way of its functioning. I will help you first identify the factors that are responsible for such malfunctioning. Food is an integral part of health and can be helpful or harmful based on an individual’s makeup. Eliminating foods or adding foods can be helpful for people with disease or for people who want to live a healthier lifestyle. I am excited to show you the life changing and life lasting approach to Rebalance 4 Health. ​"I thoroughly enjoy working with Jeanned'arc! She has made such a difference in my overall health. She is lovely and smart and generous with her knowledge. She has taught me how to heal my body by eating the right foods and in the right combination. I have struggled with my weight since I was 9 and had gone undiagnosed with Candida, leaky gut and brain fog for years. After finally being diagnosed, I was referred to Jeanned'arc. Under her care she has changed my diet and my life. I have lost weight, kept it off and I feel significantly healthier both mentally and physically. Thank you Jeanned'arc!" Appointments available in person or via Skype!